More... text-transform: none; white-space: normal; widows: auto; word-spacing: 0px; -webkit-text-stroke-width: 0px; background-color: #ffffff; display: inline !important; float: none;">This is a cute shirt for pommel horse and gymnastics fans from Ireland. Panda is performing a routine on the pommel horse, how cute! This Cute Union pommel horse design makes a cute gift for pommel horse fans and gymnasts! 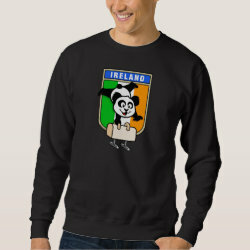 Show your support for the Irish mens' gymnastics team in totally cute and unique style!